Consumers in Ireland and worldwide have limited understanding of how news appears in their social media feeds. That was one of the findings from the Reuters Institute Digital News Report, which was released today. The annual survey aims to understand how news is being consumed globally, with a particular focus on digital news consumption and the devices used to access the news. It found that, in Ireland, only 28% of those surveyed said they understood the role of algorithms. Internationally, only 27% were aware of the role of algorithms and 73% either did not know the answer or assumed that social media companies employ journalists. In line with international trends, there is a slight decline in the use of social media for news. As a news source, in Ireland, Facebook has fallen from 71% in 2015 to 67% in 2018. The decline is even more pronounced in the US, where use of Facebook for news has fallen by 9% since 2014. However, the research shows that Instagram as a source of news has grown from 12% in 2015 to 26% this year. The Reuters Institute Digital News Report is published by the Reuters Institute for the Study of Journalism. This is the fourth year that the Broadcasting Authority of Ireland (BAI) has funded the inclusion of Ireland in the study, as part of its work on fostering media plurality in Ireland. The BAI commissioned the Institute for Future Media and Journalism (FuJo) at Dublin City University to produce a specific report on the Irish results of the survey for the last four years. The data for the research was collected between January–February 2018, reflecting the same data collection timeframe for previous years. Paying for Online News: There is a slight but steady increase in consumers paying for news. In Ireland, payment rose from 7% in 2017 to 12% in 2018. This places Ireland in line with the EU average. Growth in payments among the 24-to-34 age group rose by 6% in the past year, to 19%. The study also found a growing willingness amongst those who do not pay for news to start paying through a subscription (20%) or donation (22%). Radio as a source of News: Irish consumers’ choice of radio as their main source of news is the highest of all 37 countries surveyed. Some 13% of Irish respondents cited radio as their main source of news, compared with an EU average of 7% and a US figure of 5%. In fact, out of all countries considered in the Reuters Digital News Report, Ireland has the highest rate of radio listenership for news. Podcasts: Podcasts are more popular amongst news consumers in Ireland than with their counterparts in the Europe, the UK or US. It found that 38% of those surveyed in Ireland listen to podcasts, compared with 33% of those in the US and 18% in the UK. The EU average is 27%. Trust: At 71%, Irish consumers are more trusting of “most news” than the EU average (62%), with trust rising to 78% in news they specifically choose to consume. However, Irish consumers have low trust in social media (28%). Trust levels in social media in the US were 19% and 17% in the UK. Disinformation: More than half of Irish news consumers (57%) said they were concerned about “fake news”, similar to the UK figure of 58%. While 61% of Irish consumers said they were very or extremely concerned about stories made up for political or commercial reasons, only 17% recalled seeing this kind of disinformation. In terms of addressing disinformation, some 63% of Irish consumers said it was the Government’s responsibility to do more, while 76% believe journalists and media companies should do more. This tallies with the international figures: journalists (73%), governments (64%). Chief executive of the BAI, Michael O’Keeffe said: “Fostering media plurality is a central focus for media regulators across Europe as we adapt to meet the challenges of a rapidly evolving media landscape. In the environment in which we operate, timely, credible relevant data is essential to facilitate an informed debate and evidence-based decision making. 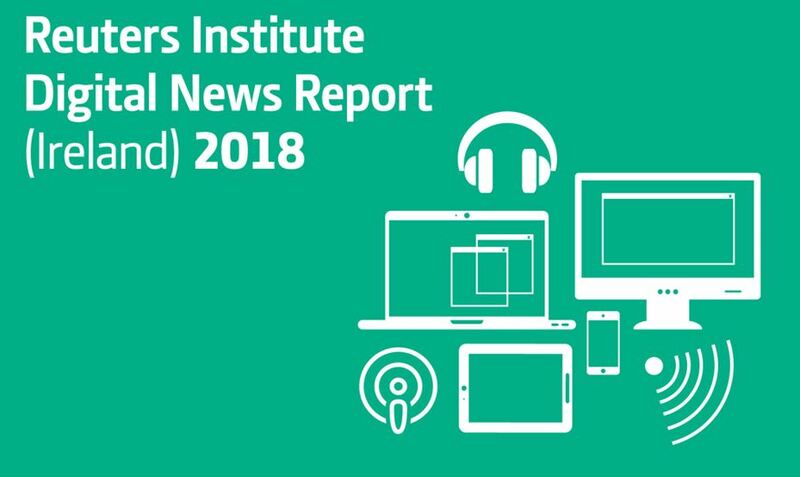 The Reuters Institute Digital News Report has made an invaluable contribution to that debate in Ireland over the past four years.